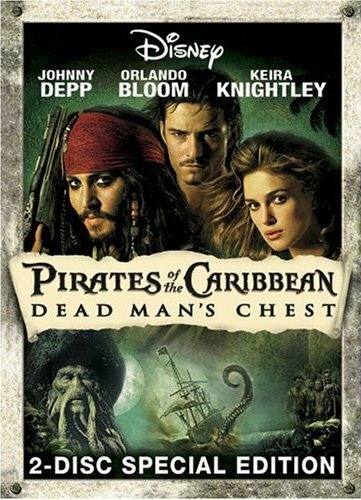 Finally saw the second film in the Pirates of the Caribbean trilogy ahead of our tickets to today’s 15:15 PDT screening of the final installment. Katharine has both of the first flicks on DVD, the special editions with two discs apiece and wads of extras and soundtracks that can rattle the rafters off buildings a couple blocks away if your home-audio system has any bass capability whatsoever. It was really long. Long as in “I was half an hour late to work” because we started it at 21:25 and the movie runs 150 minutes. I had no idea it was that long. I guess from the association with Disney and the Pirates of the Caribbean attractions at Disneyland and Walt Disney World, attractions which I would conservatively guess I have ridden a combined 200 times in my life, I wasn’t expecting some of the amazing violence of this film. Most of it was off-screen, but the number of deaths by axe-to-the-head and similar was surprisingly high. But I enjoyed this flick. The right mix of action, adventure, peril, humor, absurdly over-the-top situations. Big guns and swordplay and wordplay and some pretty nifty special effects, but some others that plainly were effects, so laughably mismatched to their live-action surroundings that suspension of disbelief went right out the window. The lead characters’ ability to avoid death or even minor injury was astounding as well even while it contributed to the general cartoony light-hearted feel of the movie. Word to the wise, however: There is a scene involving captives in suspended cages and wildly flapping birds and pecking and such, and by purely absurd timing I happened to ingest a small round piece of sweet-and-sour pork at the exact moment one of the captives experienced an utterly cringe-worthy and what I imagine must be hideously painful pecking incident also involving a smallish rounded body part, and quite suddenly I wasn’t hungry anymore. Which was fine, because there was some other slimy and writhing and similarly disgusting imagery after that. Nothing that got my gorge rising but I thought, if I were 12 years old, this would be the highlight of my movie-going experience. Did I lose a day? Got to work about half an hour ago, my usual time, ready to tackle the Wednesday shift. Nothing special going on today, turns out I have two sites to build in one of the dev environments and otherwise it’s a pretty typical day of support functions. Then I saw in the corner of left monitor the taskbar clock showed the date as Thursday 05/24/07. Been nearly five minutes now, I’ve asked my coworkers (twice) if it’s really Thursday, verified the date on my desk phone and on my Treo, and I still don’t believe it. Flickr: Don NunnI was goofing with my pin toy and before I knew it, I’d pulled off all four nuts. I moved last month. I had lived in Mill Creek in a two-bedroom, two-bathroom three-story townhouse, garage in the basement with living/dining rooms and kitchen on the main floor and bedrooms upstairs. Now I live in a one-bedroom flat in Seattle’s Lower Queen Anne neighborhood. I have a view of the Space Needle. My cats were insanely fond of rushing up and down the stairs from the main floor to the bedroom floor and from the front of the house to the back in occasionally endless loops. They have had to find new entertainments in the new place. They can run from the front door to the back wall in about 3 seconds flat, and there’s no really good straightaway from the living room to the dining room like there used to be. Also they have to make a hair-pin turn from the living/dining area to the bedroom area and that really slows them down. So they have replaced their previous running-about-the-house with two activities that I find maddening, if endearing. First, they learned how to open the cabinet doors. The doors don’t have handles; the edges are beveled and you wedge your fingers in to pull the doors open. Just the right beveling depth for them to nose the doors open and then rummage through the pots and pans, bathroom items, whatever. Second, they’ve become door-stop percussionists. Those little spring-style door stops, with the little rubber caps. They hit them sideways and there’s this charming THRUM that starts out throaty and ends squeaky as the vibration ends. Very disconcerting to turn on the bathroom light in the middle of the night and find a cat’s eyes staring back at you from the depths of the sink area, or to hear the TWANG of the door stops just as you’re about to drift off to sleep. Search on the phrase Don Nunn (no quotation marks) and the entire first page of results (under Google’s standard of 10 results per page) represents me. Second page, all but one result is a link to one of my sites or a site related to me specifically. Search on “Don Nunn” (include the quotation marks), similar results—first page, all me; second page, all but one result me. Select an MP3 on your device, make it available as a ringtone. You can select just portions of files too. Freeware. Most of my regular daily visits are news-related. I also track 200+ sites through Google Reader, a mix of news and friends’ sites, technology, entertainment, the works. Makes viewing a wide range of content much easier.